Tis the season for all things spooky, and an upcoming event in Bardstown is no exception. 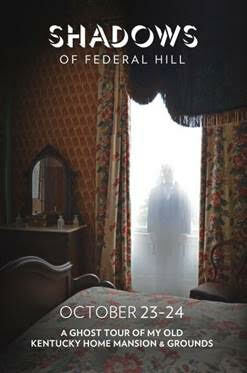 The event takes place October 23 and 24 at My Old Kentucky Home State Park. The tour of My Old Kentucky Home begins with a walk up a latern-lit path to the visitor's center, complete with a 19th century hearse. An undertaker will lead guests into the Federal Hill mansion with the mood set by (presumably) spooky music. In each room of the mansion, participants of the tour will see visitors and residents of the mansion, even Stephen Foster makes an appearance! “Shadows of Federal Hill” is an hour-long ghost tour experience that begins each evening at 6 p.m. Admission is $16/adults and $10/children, and includes Victorian treats (cookies and candy), a fortune teller and hay rides. Make it a haunted weekend and overnight in Bardstown, one of the most haunted places around, according to world-renowned Certified Ghost Hunter Patti Starr, who conducts ghost treks through the streets of Bardstown every Saturday night (with Fridays added in October). Several of Bardstown’s 17 bed and breakfast inns are known to be haunted, including the Jailer’s Inn and Old Talbott Tavern. Be sure to let us know if you take part in this adventure!